As the Hardsploit Core Framework is over, we continue with the development of Hardsploit modules. A Hardsploit Module is like an Exploit Module for Metasploit. 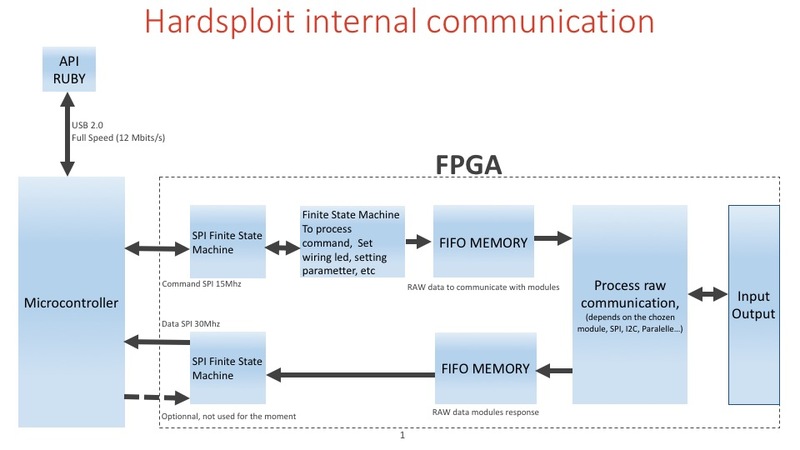 It’s a piece of FPGA code that have a dedicated hacking (or auditing ;-)) function; Each module will offer functionalities such as dump, read & write, interact, Proxy or sniff etc. To begin, we have designed a module related to parallel memory. Why? Mainly because, to our knowledge, there is no tool that can achieve that in a simple way. The parallel memory module for example, looks like the following. It will use the Core FPGA Hardsploit module. One PLL to obtain 150Mhz from 50 Mhz oscillator. The module can send information to the second fifo and send the content to the microcontroller (uC) by spi master. There are 2 finite state machine to organize all tasks. Microcontroller send data to ruby for each receiving data by FPGA by DMA (Direct Access Memory) of the uC. 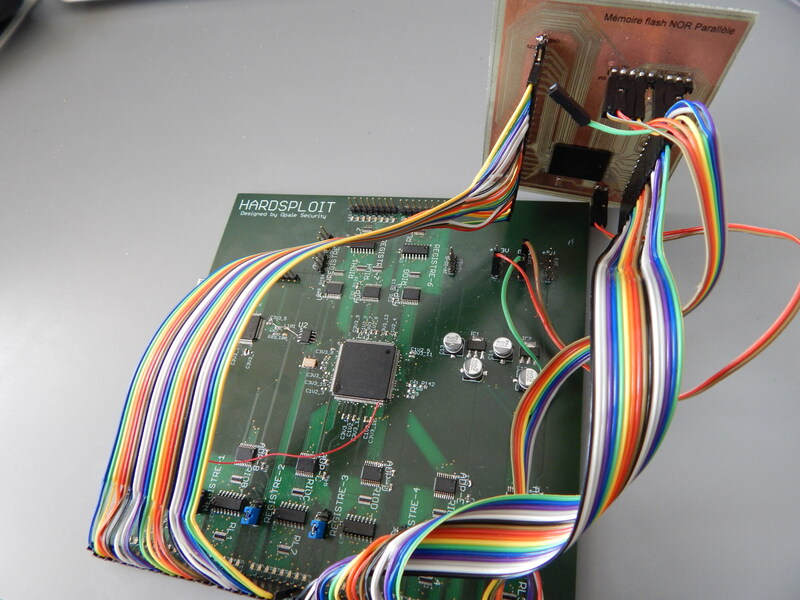 In brief, we have created a FPGA module that is able to dump most of parallel memory chip. It will help security pentesters to dump firmware or all content contained in such memory in a easy way. Easier than if you need to create a dumping wiring function each time … No more arduino like board with plenty of wiring difficulties to connect to your chip, no more trouble to find the right memory command to be able to dump the component in front of you… The GUI will help you achieve that in few click only. Faster, as we use High Speed FPGA buses and machine state to achieved the dump. What type of Memories we could dump for now? For example, a dump of 128MByte memory chip. 1st result : only 5 to 10 min to read a embedded linux rom of 128MB. How to use that funky and (over) hype parallel dumping and writing function ? We create a low level API with ruby that let you interact with FGPA module (Harsploit Module) in a simply way. See below an example of code we use. One function to call , few parameters to send (block to dump), few command to drive the chip. All those parameters will be soon pre input via the use of the GUI.